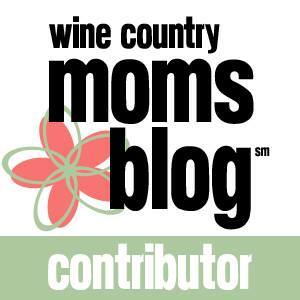 About thirty minutes ago, I wrapped up an application to blog for Sonoma County Moms Blog. Two minutes ago, in the midst of a "my children are both napping" snooze fest on the couch my eyes POPPED open. Not only did I skip a question, but I skipped a question after I went on for a bit about my passion for doing things well in a answer to another question. Let it go, I told myself. Learn from this. This is the type of thing that I do. I get excited. I set aside some time to fill out an application, to write an essay, to make a recipe, and I skip a crucial step. I've done this since adolescence. My teachers would frequently circle the blank spaces next to math problems I'd simply skipped. My college professors would point out the lapses in logic that I know were addressed when I outlined the essay. Five Tips for Staying Sane as a "Harvest Widow"
I'm going to post this blog entry in the comments section of the application and hope for some points for creativity. Towards another point, I also recently finished reading "Why No One Is Reading Your Mom Blog" in advance of our newest Turn Up Tuesday, and I do want to take some advice from that post and provide "something of value." While I'm still hard at work taking this advice myself. Here are Four Quick Tips to Help You Get It Together (you can assume I've done the opposite of these at least once...maybe four times). Keep Calm and Do Less - Yeah, I'm the poster child for doing the exact opposite of this, but I'm trying. Say no, have fewer commitments, and, I promise you, what you still have to do will simply get done better. Sleep - "Sleep when the kids are sleeping," is advice that goes on, I'm guessing now, until the kids are in college. Whenever I don't take even a power nap when my kids are napping, whenever I push myself wellllll past their bedtime...well, let's just say that whole "Nothing good happens after 2 p.m." is more like "Nothing good happens after 10 p.m."
Learn from Your Mistakes - I've had plenty of lessons to learn from, and, today's case excluded, I've really gotten much better. 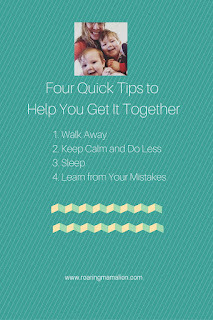 When I follow tips 1-3 and keep reminding myself of tip 4, well, I feel a lot less anxious about silly mistakes I've made. And, wait, there's more. I've even made a little downloadable for you - click the image at the end of the post :). I really do want to write for you. I want to share my humor, my mistakes, my advice, and grow my community with you. I'm sorry I skipped a question on the blogging application - my tiny humans are steadily eating my brain, and I am working, bit by bit, to put it back together.